Dutch defender Alexander Büttner has completed his medical, agreed personal terms and signed for Manchester United on a five-year contract until 2017 in August 2012. It was a surprise signing from manager Alex Ferguson who signed the young defender from Vitesse Arnhem on a non-disclosed fee. Buttner was in dispute with the club and wanted away. A few weeks earlier a deal with Southampton was cancelled just before the finish line. Buttner started in the Ajax youth academy but moved to Arnhem soon with making his debut in the 2008-09 season. At the end of June 2014, he moved to Dinamo Moscow for a 3,5ME fee on a 3-year deal. The Dutch defender saw no first team chances anymore in Manchester and decided to find his playing opportunities elsewhere. 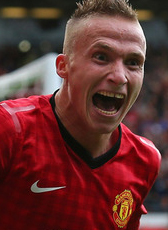 In January 2016 Büttner went on a loan deal to Anderlecht until the end of the season. Büttner had not played an official game since August 2015 when he left Dynamo Moscow for the Belgium side. He played 16 matches in Belgium before returning to Moscow for his final contract season. In January 2017 he returned home signing a 2,5 year contract at his former club Vitesse Arnhem.